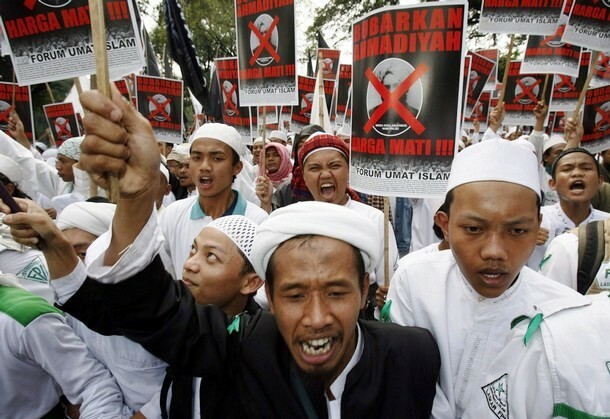 Indonesia: Record number of anti Christian attacks in 2010 | Is the Quran the Word of God? Between January and July, 28 incidents were recorded compared to 18 for the whole of 2009 and 17 for 2008. Bekasi holds the record. “It seems that people and the government do not realise that the right to worship, as stipulated in the Constitution, comes with the right to have a house of worship,” says the deputy chairman of the Setara Institute for Peace and Democracy. Jakarta (AsiaNews/Agencies) – The first seven months of 2010 were marked by a record number of anti-Christian attacks, the Setara Institute for Peace and Democracy said in a report released on Monday. Altogether, 28 attacks on religious freedom were recorded between January and July, compared with 18 incidents in all of 2009 and 17 in 2008. Bekasi saw the highest number of incidents with seven, followed by Greater Jakarta with six. If the trend continues, the institute warned the total for the year might be more than three times that of last year. By contrast, attacks against the Ahmadiyah community were down, 4 in 2010 compared to 33 in 2009. In the eyes of most Muslims, the Ahmadis are a heretical sect that believes its founder, Mirza Ghulam Ahmad, was the last prophet of Islam, a claim that contradicts mainstream Muslim beliefs. Not only are anti-Christian attacks up, but many go unrecorded. Ismail Hasani, a senior Setara researcher, said that what is know is only the tip of the iceberg. “We rely on our network to record the incidents, but there are others outside our coverage area,” he said. Police plays an important role in the violation of religious freedom, Setara deputy chairman Bonar Tigor Naipospos said. The growing problem showed the government’s monitoring of religious harmony was ineffective. The central government, however, defended its handling of the situation. Ahmad Syafi’i Mufid, head of Jakarta’s Forum of Religious Tolerance and head researcher at the Ministry of Religious Affairs, said the ministry had done enough. “They are the ones who are trying hard to avert conflicts,” he insisted. He also defended local administrations’ conduct. “I think regional governments are just confused. They receive so much information that they do not know who is right or wrong,” he said. In the end, the data back what AsiaNews has reported on several occasions. Anti-Christian violence is up in Indonesia and Muslim extremists are increasingly targeting Christians. So far in 2010, Muslim radicals have disrupted religious services, stopped Christians from attending Mass, destroyed Christian places of worship and prevented the construction of new churches.